What is a LOCAL EVENT? Generally not a Virginia PTAC organized event. These listings are a topic of interest to our clients that we repost for your convenience. Virginia PTAC has a collaborative partnership with Govology which allows us to pass along a significant discount to our clients of 70% off the price of individual live or recorded webinars or the annual membership fee. More information here. Additional details about the location are found within the Instructions section on each class or event. Use the Keyword Search to refine your results by City. A single event may show up in multiple topic areas based on the content and subjects applicable. If you want to understand more about the topic areas, contact us for additional information at 703-277-7750. Some of our classes offer Continuing Professional Education credits (valuable for professional accountants and others). Please use the Keyword search to find classes that list “CPE” in the description. We do not accept American Express. Payment can be made via your user profile after signing up online. If you experience any problems or do not receive a confirmation, please contact us at ptac@gmu.edu for confirmation that payment was received. First register online using the sign up button for the class. 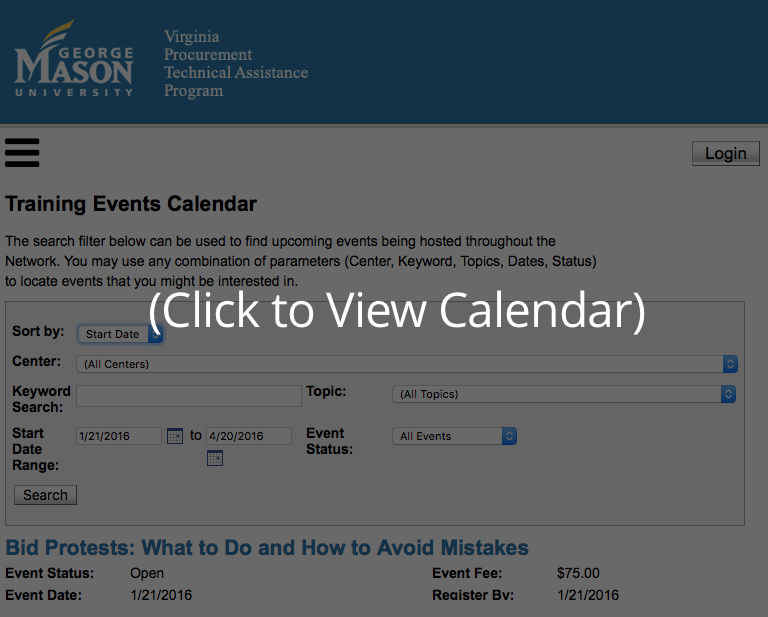 Once you receive an email confirmation of your registration, make checks payable to “George Mason University” and put Virginia PTAC in the notes field before mailing it to Virginia PTAC, 4031 University Drive, Suite 100, Fairfax VA 22030. Please include information about the class or training event and the name of the registrant who will be attending if different than the name on the check. Additional information about registration and fees, our refund policy, special accommodations, and inclement weather can be found here.